I’m writing to you from beautiful Jerusalem, where my husband, Shalomy and I are so grateful to be for the Jewish holidays. This visit is going to be different from any that we’ve had before, as we are staying with my in-laws and with all the celebrations and family visits I am going to have very little time for anything else. It’s super duper hot here, (actually, not hotter than Baltimore, but AC is a rarity!) so putting more than two 2 in 1s on my head during the day is just not a wise idea. I’ve also been leaving my ears out! 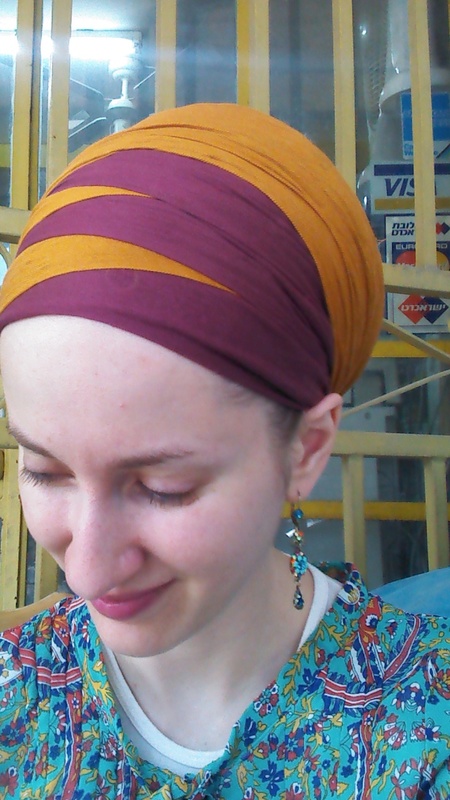 Here are two styles I’ve worn since getting here (I didn’t manage to get photos on Rosh Hashana). And I finally got to try out The Gigi Wrap! I am totally in love! I hope you are all doing wonderfully, wherever you are, and may you be blessed with a sweet, happy, and good new year! Shalom and here’s wishing you a very happy and sweet New Year also. It’s so difficult in extreme heat isn’t it? I can still only manage a single tichel where I am in AZ. Just want to say how lovely the Gigi looks. Simple but great look. Enjoy the beautiful city! We are taking our family there in the spring…..soooo excited!!! Shana Tova! Shana tova — Enjoy your time in Jerusalem. I am very grateful to have discovered your blog just when I need to do something about the hair loss from chemo. I’ve seen other websites but yours is the only one I could actually follow (although I might cut the eternity scarf at the seam and NOT have to deal with that issue). Cutting the eternity scarves at the seam is a wonderful idea. I did that with one of my favorites and loved how it turned out! It’s also much easier to use. I just finished doing chemo and radiation and the tichels were the absolute best things ever! I have worn wigs all my life, but couldn’t stand the feeling of one on my head when my hair was gone. This is the best place to buy your headband/volumiser…they work great. Glad you found this place! gmar chatima tova to you and your family. Do you come to Israel once a year? For chagim? I feel like you’re here tons (of course, I never meet you, LOL), but can’t figure out when to expect it. My husband is Israeli and I made aliyah so technically this is home! We do try to come once a year. We’re waiting for you to come back for good! When it’s hot out, I generally avoid using anything more than one scarf at a time. And I don’t cover my ears in the summer. Two more things we have in common. I hope that you and your family are enjoying being home. May we all be together in Eretz Yisrael very soon. And may you and your family be blessed with a G’mar Chatimah Tovah. very pretty ,enjoy your visit. I do so adore the burgundy/exotic spice combo on you – the colours wouldn’t work on me, but they shine on you. Are you wearing your volumizer higher lately? Hello Andrea. I feel so bless to be able to learn about hair covering and what it represents. But , in my situation, hardly no one where I live understand the conviction that I received from Hashem. I’m 48 years old , and I’m single. I had been divorced since 1992 , but I started seriously my walk of faith eight years ago. I cover my hair to honor Him. He is my head , my authority, my husband my everything. He took me out of the darkness and now I’m a new person. I feel so protected when I cover my hair and beautiful at the same time, because He makes me feel beautiful through His love. So I thank Hashem for you for using you as a vessel of honor.